Tom Cruise, Dougray Scott and Thandie Newton star in director John Woo’s action spy thriller Mission: Impossible II. Watch the movie trailer below. Ethan Hunt (Cruise) is sent to Sydney where he partners with an international thief (Newton) to stop a renegade agent (Scott) from releasing a genetically modified disease on an unsuspecting world. MPAA Rating: PG-13 for intense sequences of frenetic violence and menace, disturbing images and some sensuality. 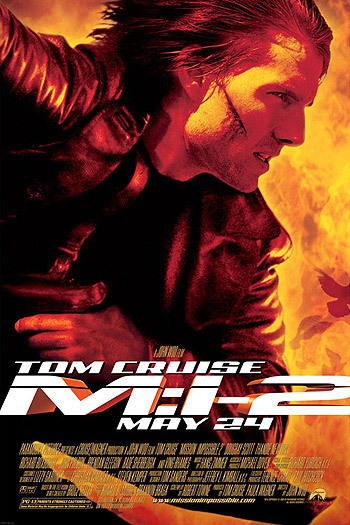 The world’s greatest spy returns in M:I-2. Ethan Hunt (Tom Cruise) is sent on a mission to Sydney, Australia. There, he partners with international thief Nyah Hall (Thandie Newton) to stop renegade agent Sean Ambrose (Dougray Scott) from releasing a genetically modified disease called “Chimera” on an unsuspecting world.